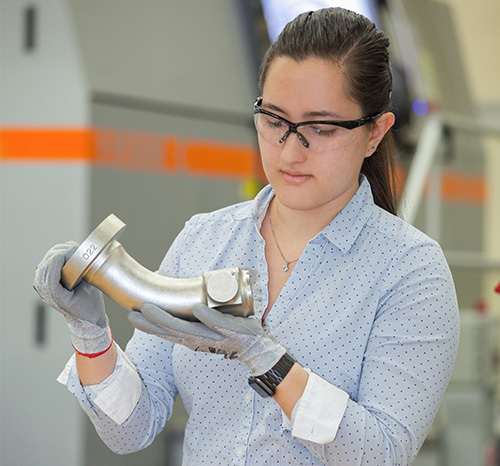 Leana Osmer (AE ’16) examines an Aerojet Rocketdyne SLM (selective laser melt) exit flange. As a young girl, Leana Osmer (AE ’16) would stand on the driveway with her parents and sister, gazing up at the California sky. With anticipation, Osmer and her family searched for NASA’s International Space Station—a small, bright light traveling across the starry night. Osmer’s mother, Diane, had helped to develop the software that determined the orientation of the station’s solar panels. Osmer, now a component product engineer (CPE), is her mother’s co-worker at Aerojet Rocketdyne in Chatsworth, California. The world-recognized aerospace and defense leader provides propulsion and energetics to the space, missile defense and strategic systems, and tactical systems and armaments areas. Even as a child, Osmer wasn’t satisfied with only looking up. After seeing the Blue Angels perform in an airshow when she was in the eighth grade, she decided she wanted to be a United States Navy pilot. After high school she enrolled in Illinois Tech’s aerospace engineering program on an ROTC scholarship. Although a number of pilot program requirements, as well as Osmer’s unmet expectations, eventually grounded her plans to join the Navy, the CPE position at Aerojet Rocketdyne became available after Osmer’s graduation. While her mother has always worked in software, Osmer says her own work involves “the building-things side” of hardware. "At some point, we envision having people onsite in places like Mars, but we have to ensure their safety." Building things had been instilled in Osmer at a young age. As much as her mother inspired her to look up, Osmer’s father, Harold, insisted she “look beyond her nose.” Osmer explains that her father built a woodworking shop in their backyard for the sole purpose of teaching Osmer and her sister to put aside their handheld video games and instead work with their hands. Today Osmer says that—in simple terms—she works on a rocket’s “plumbing,” which involves the creation of small components to connect the large components, such as the lines that carry fluids from one side of a rocket’s engine to another. She and her team are working on components for the new RS-25 rocket booster engine, also known as the Space Shuttle Main Engine, which will support the missions of NASA’s 70-metric ton Space Launch System (SLS). The SLS is designed to send astronauts and cargo to explore the moon and other deep-space destinations. A cluster of four Aerojet Rocketdyne-built RS-25 engines will provide thrust for the launch vehicle’s core stage. The thrust provided by the engines could keep eight Boeing 747s aloft. The process of designing and building the larger and more complex components of the rockets involves additive manufacturing, also known as 3-D printing. Osmer says the importance of today’s additive manufacturing is far reaching, and she hopes to have a hand in 3-D printing advances. As Osmer takes part in imagining such a future, she is obviously a product of her past and the “rare family dynamic” of a stay-at-home dad and a mother in the aerospace engineering industry.